Myron Dueck is a vice principal and teacher in School District 67 in British Columbia, Canada. He has previously taught in Manitoba and on the South Island of New Zealand. Over the past 17 years of teaching, Dueck has had experience in a variety of subjects in grades 3 to 12. As a teaching and administrative leader, Dueck has been a part of district work groups and school assessment committees that have further broadened his access to innovative steps taken by others. He has presented his student-friendly assessment procedures to fellow educators in British Columbia, California, Idaho, Kentucky, Nevada, Oregon, Texas, Washington, and Greece. Recently, Dueck presented in both Los Angeles and Chicago at the ASCD Annual Conference and has twice been published in Educational Leadership magazine. Based on Myron Dueck's popular keynote speech, Ask Them is a fun, humorous, fast-paced three-episode documentary series that explores how asking students for their input radically transforms both student learning—and the dynamic between teacher and student—in amazing ways. 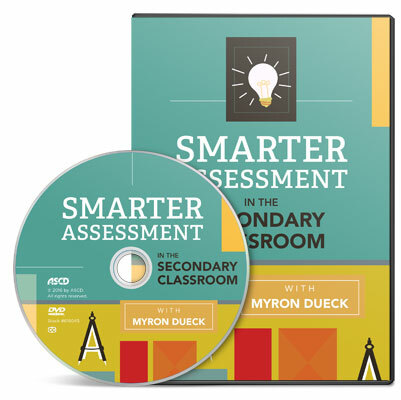 In this video program, Myron Dueck explores assessment practices and grading policies that allow students the opportunity to really demonstrate their learning, and shows how over time these practices lead to greater student achievement in the classroom and beyond.